Are you talking about when Padme was talking to the senate in TPM and the camera pans across different senate pods and one was occupied by a species that resembles ET? If so, yes, lots of people have noticed this before. Please please please please proofread your posts before entering them. And yes I have seen the ET aliens. Also, why did you say "the first new moive," opossed to Episode I or the Phantom Menace? ET has the wider head near the eyes, a longer neck, thinner arms, and etc. 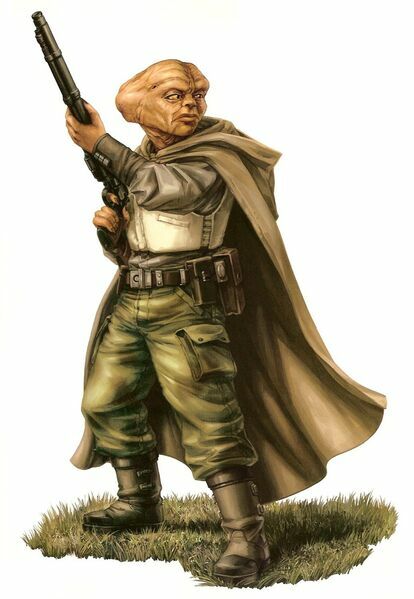 Also the ones in TPM weren't really dressed to well, all the pictures of Dresellians I've saw had them fully clothed like the one in this picture. Yeah, I saw the X-Wing and Tie Fighter. There's also a Shaak in the asteroid field in AOTC. They put the extra terrestrial in because a Yoda mask was used in E.T. george and steve are also really good friends. i've never noticed the x wings in aotc. there's a lot of little "easter eggs" in there. where should i be looking for that? The X-Wings and TIE Fighter are when Anakin and Zam are both zooming downwards (right as we're going into the "pull up, Anakin, pull up" part), if you turn the commentary on I think they say exactly when it is. Wikipedia which we all know is bot the most reliable source for information. I agree with Fetterthanyou, Wiki lies more often than not. I don't know about lies, I only use it for anime overview and weapon articles but you can tell how accurate it is by checking the source links. Actually Wiki's are pretty good when it comes to info. Now, I wouldn't trust the Mario section since its written by the Lemmy's Land retards, but its all good. I believe there is also a kitchen sink floating in space during the Battle over Coruscant in Episode III.